Recently, I was fortunate enough to compete in the New York Business Plan Competition for college students in New York State. 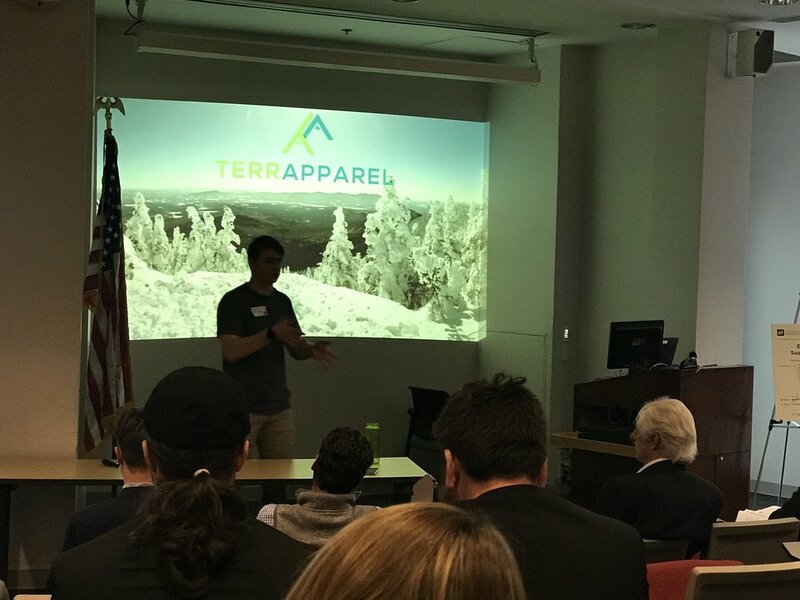 TerrApparel competed in the NYSERDA Energy and Sustainability Track where we placed first in the North Country Regionals and third at the State Finals. Every team competing had an idea that will change our future for the better, and to place third among them was another validation to the credibility of our mission. In a competition like this, many teams have an amazing innovation they are showcasing. Their entire plan is based around a product or small group of products that they hope will change the world. They have provisional patents, comprehensive advisory boards, and tremendous momentum. Meanwhile, I showed up to Albany with one goal: to show the judges my passion and my vision for a better future. I don’t have a comprehensive advisory board or provisional patent. I just have the idea to save our planet one piece of clothing at a time. After the regional competition, the main feedback I received was that I needed to prove to people that we’re “more than just a clothing company.” I understood where they were coming from. With the competition I had, it made sense that I needed to prove I had some ‘secret sauce’ that was going to change the world. But it didn’t sit right with me. Sure, we are doing something special by focusing on performance clothing as the solution to plastic pollution, but it was ok to do that while also being “just a clothing company.” I tried to put as many statistics into my pitch about how we go about being the solution rather than the problem, but I knew it could not compete with provisional patents, and tech companies with fast growth business models. What we are doing will not happen overnight. It isn’t simply about getting the word out. Developing our products takes time, especially when we must ensure it is done right. We aren’t selling an app that can generate millions of dollars overnight. So I stuck with my gut, I stayed true to our values, and it would have to be enough. Sacrificing our identity was not an option. Going into yesterday, I knew that my pitch was solid. It showcased the beauty of our planet, the problem facing us, and how TerrApparel can solve it. It included more statistics, more powerful images, but most importantly, it made it clear that we were doing it as a clothing company, not superman. Every team I watched pitch before and after me had an amazing idea as how to change the world. The question remained: would mine be enough. As stated at the top, it was enough for third, and I could not be more proud of that. It showed that ‘just a clothing company’ with a vision can properly compete with others who are surely out there to change the planet in their own right. Overall, the competition was the best learning experience that a new business owner could ask for. Not only did I learn how to better pitch our company next year, but I learned to never let our identity as a company fall in the sight of money. Leaving the competition yesterday, I had the peace of mind that we could save the world too; one piece of clothing at a time.